The mainstream media continues spreading unverified information through its platforms while ruing about ‘fake news’ at the same time. 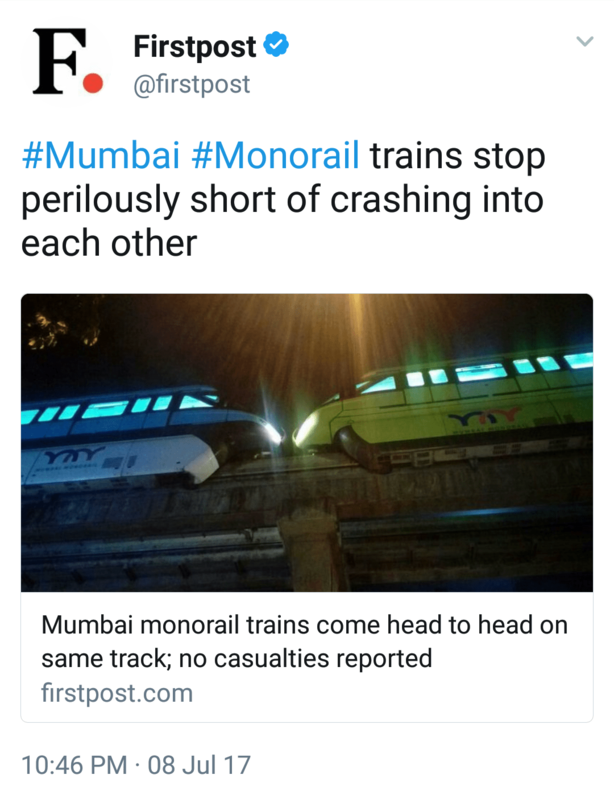 Another example of this was witnessed yesterday, when many media reports suggested that commuters in Mumbai Monorail almost fell victim to a deadly head-to-head collision. A picture of two monorail trains almost touching each other was touted as a proof of this averted collision. The trains did appear to be moving in opposite directions and stopping just in time to leave hardly a few inches of space between them. However, the truth was something else, and it was brought to fore on Twitter by a journalist named Rajendra Aklekar, who has been a working journalist for 21 years and has even authored a best-selling book on Indian Railways history according to his Twitter bio. The Mumbai Metropolitan Region Development Authority (MMRDA) said it was a “technical error”. “One rake had suffered a power failure. So another was sent to tow away the affected rake,” it said. 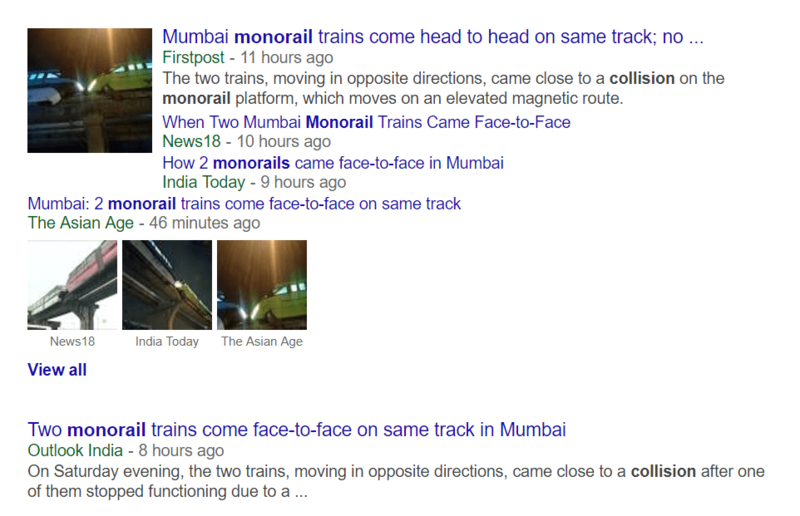 So either the Firstpost staff did not understand what MMRDA said or they deliberately chose a false and sensationalist headline that would make Mumbai residents feel that the monorail systems are so horribly wrong that there could be a head-on collision between trains some day. It is not clear if the above “former journalist” was told by someone that it was an averted accident, or he just assumed so by looking at two monorail trains being so close to each other. But somehow his tweet, and possible assumption, was taken as a credible piece of information and the media outlets repeated the ‘accident averted’ line even though MMRDA had clarified that the other train was sent for rescue. Sadly, hours after the clarification by MMRDA and the tweet by Mr. Aklekar, The Asian Age published an ANI sourced report this morning that made the same claim. It looks like the “trains almost collided” line is now going to be repeated by other media organisations as a news agency (ANI) has filed the report. A mistake by an agency gets repeated all over, as media outlets usually re-publish agency reports without cross-verification.